Some businesses have such barriers to entry and such competitive advantage that they can still thrive even with poor execution. Companies that have patents, government regulation, rocket science(very tough intellectual property to copy) , massive development costs to get into the business, high capital cost, high market share etc. EMJ was an execution business. It was simply not that hard for anyone to get a product line to distribute. Over time we were able to grow to create barriers to entry with things like size, having the "good" lines, and having market share within a niche but in the end, it was always still an execution business. 1 - Be frugal. Frugal does not mean cheap, it means getting appropriate value for money spent. Spend on function, not on show. 2 - Focus on process. The key is to create replicable steps that can be repeated time after time. As an early entrepreneur, often this means trying it yourself. Time how long it takes to make 10 calls. Track which message gets the most meetings. Refine and learn. 3 - Test everything. Fail Often, Fail Fast, Fail Cheap. This is a continuation of Focus on Process. 4 - Look for areas of minor competitive advantage. Really that is what execution businesses are all about. Although they may lack the monopoly or defacto monopoly characteristics of other businesses, they can have minor advantages in many different small areas. If I look at why EMJ was a success, it was not one thing, it was a number of tiny things. 5 - Know your numbers. By nature, execution businesses have small margins for error. Competition ensures that there are few "high profit" opportunities. So knowing what areas make and lose money and knowing true costs is essential. 6 - Look for niches. Often execution businesses can develop competencies within a specific expertise. Within a niche, it is easier to be the expert - less to study, less people with your focus. It is also easier to figure out ways to thrive and customize your company to address only those specific things the niche needs. 7 - Work hard. We worked long and hard year after year. My work ethic was a competitive advantage. 8 - Take full responsibility. It does not matter if the economy is good or bad, if China is selling for X, if the US$ is trading at Y, or "the VP sales cannot sell well enough" or any other "condition". Those are just conditions. We live with them and figure out how to be profitable. There are no excuses - if we fail, we are the ones that did not execute well so we need to change our product, our approach, our tactics and anything else. 9 - Study and practice time management. I think that is why I ended up writing a book on time management. This is really an extension of Be Frugal. Time is the biggest cost so get the best value from it possible. Staff is the largest expense for most companies. Maximizing return from staff expense is a highly complex problem. People by nature are complex. I read a book by Anne Bruce, Brenda Hampel and Erika Lamont called "Solving Employee Performance Problems - How to Spot Problems Early, Take Appropriate Action and Bring Out the Best In Everyone". I tend to prefer books with more positive titles (although bringing out the best is positive). I wonder if thinking of things as a problem can become self fulfilling. The first chapter has a perfect title "Set Expectations to Avoid Performance Problems". It is so much easier to not have a problem in the first place. The book goes on to set out a model of performance management that includes things like assess, set expectation and monitor. The book has tons of examples with sample conversations that could be useful for any manager. I often find performance challenges can be a result of people being in the wrong job. The ideal is to find them a position that more closely aligns to their passion. Passion creates engagement and then performance. One thing I like to do (although clearly am not perfect at) is coach, train and mentor. Often performance is a result of lack of understanding of how to do the job well. It would be great if the boss was all knowing and knew the correct answer to everything but that is not the case. I actually think we suffer from too much meddling by bosses that does not add value. I much prefer to set the goals and let people do their jobs. Not doing that can limit the size an organization can grow to. Performance appraisal should be ongoing. Truly solving HR problems would be the magic bullet for all businesses. I read a great book abstract at Getabstract on The End of Wall Street. Although it seems obvious - selling houses to people with no credit, no assets, no jobs was a recipe for disaster. I wonder if the American dream of home ownership for all and the government encouragement by mortgage deductability is sustainable. There is an interesting blog post emailed to me by a friend on Michael Hyatt's Blog on using batching for time management. I have previously blogged about the Pomodoro Time Management system and use that technique myself almost daily. The blog post reinforces the "why" of using that system. This ties into a great HBR article emailed from another friend on "This Space intentionally left Blank". The gist of it is - creativity, productivity and success happens if there is some space left in the schedule. I finally got a New York cell phone so anyone who needs it, email me. On a personal note, I was blessed by a visit by my daughters Beth and Laura this week. Had a great time. We went out to see the Daniel Radcliffe and John Laroquette musical "How to Succeed in Business Without Really Trying". My kids picked it. Perhaps they are trying to tell me something. It was an awesome play. The actors were outstanding. It is billed as a musical comedy and it was hilarious. Highly recommended. Not sure I got any good business tips though. I wrote a post at CMA Blog on selling to CEOs. Grossman’s basic point is that in order to be a leader, you need to effectively relate to others’. Communication skills are a craft, mastered by only a small percentage of corporate leaders around the world. With the right communication skills, leaders can bring their companies to a level of success that they likely would not believe is possible. If you enjoy your job, work does not become an arduous task, but a place where you want to maximize your potential. Grossman highlights the need to make your employees feel optimistic and enthusiastic about the company as these feelings all originate with mutual trust and respect. Your employees should also feel valuable, appreciated, and comfortable as these are key motivational factors that make your workers want to give that extra effort that could really make a difference. As a student, there is no shared goal in the classroom. My leaders (professors) have no real interest in how well I do in their classes and the most we can do, as students, is hope all those A’s one day add up to a happy life with a good job. Thus, we are completely on our own as many stay up all night studying wondering, “why am I doing this again?” As Grossman points out, people are often more enthusiastic about their work when they are part of a goal bigger than themselves. As a leader in the corporate world, creating that environment of unity is essential and clearly, I could not agree more. 3) Bosses are honest with you. Although this is not the mindset of all Millenials, it certainly seems to be the overwhelming view from my observations. The supervisor who understands this thought process will, in the long-run, likely produce the most talent possible out of the younger employees. 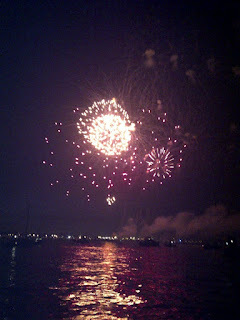 I experienced my first Fourth of July in the US (think I was traveling last year). Complete with unbelievable fireworks and dinner with friends. My time trick for today is stolen from Nike. "Just Do It". "Just Do It" helps me get things done and off my plate. 1 - Would I like to have done this by the time I go to bed tonight? 2 - How will I feel when it is complete? 3 - Does not doing it add to my stress? 5 - Will it get better if I do not do it? Or will it be easier if I leave it longer? If the answer is yes, then I should likely drop it from my list. If the answer is no, then I should "Just Do It"
So off to Just Do It.